How do you improve upon a pair of noise-cancelling headphones regarded as the market leader? That's the challenge Bose faced with the QuietComfort 35 Mark II. The company's answer: go smarter. The Bose QC35 II is almost exactly the same pair that won us over in 2016, the main difference being a dedicated action button to launch built-in Google Assistant for voice control. Is that enough to make the QC35 II the must-have noise-cancelling over-ear headphones to buy? Very little - if anything at all - has changed from an aesthetic point-of-view compared to the first generation QuietComfort 35. The Mark II is the same recognisable shape and design, with exposed screws and a well-padded Alcantara-lined headband with super-soft padding around the earcups. As an aside to this: don't let that fluffy, soft-looking felt fool you, as Alcantara is a very durable material that's commonly used in expensive fast cars. When it comes to how the QC35 is built, it's definitely a case of function over form. But that's no bad thing. Rather than go for a completely seamless exterior with sculpted edges or swooping lines, Bose has gone down the approach of giving you easy access to physical buttons and cleverly designed hinges. In doing so, it's made the headphones more convenient to use and more convenient to pack away when you're done. One prime example of this focus is evident in the physical controls. The power button is a slider switch on the exterior of the steel-coated right earcup. It clicks firmly between on and off, while a further push over to the right puts the earphones in Bluetooth pairing mode. On the left earcup there's the action button - which can be used for activating Google Assistant or active noise-cancelling (ANC) - which is placed roughly where your thumb would naturally rest if you raised your hand to the headphones. The usual trio volume up, volume down and play/pause buttons are sat all together on the right earcup. Thanks to the chunkiness of the buttons - and the fact that the play/pause button doesn't protrude as far as the others - it's very easy to use them. Perhaps more reassuringly, the buttons all give a subtle-yet-pleasing click when pressed. Unlike some headphones that have touch-sensitive controls, there's no second-guessing as to whether or not you've pressed one. As previously alluded to, the hinges, pivot points and adjustable headband make the QC35 really comfortable to wear and easy to pack away. There's a semi-hard case that comes in the box, so when the earcups are rotated until completely flat and the hinges sit above one other when stowed, the headphones can fit into this surprisingly portable case. It's certainly easier to carry around than the rounded, bulbous case that comes with the Beats Studio 3 Wireless. All these details combined with the glass-filled nylon and corrosion-resistant stainless steel create a durable headphone that's both convenient, light and very comfortable to wear for long periods. We wore them for an entire working day and didn't once feel the need to remove them either due to discomfort or sweatiness. It must be said, though, we were testing them in a particularly cold spell in February, so it may be a slightly different experience during a heatwave. Bose was the first company to announce that it was bringing Google's smart assistant to a pair of headphones. Since then, other companies have jumped aboard - including Sony - so we're looking forward to this voice-control feature going even more mainstream. If you're an iPhone user then you'll first need to download the Google Assistant app from the App Store, then head to the Bose Connect+ app to ensure Google Assistant is selected as the primary function of the action button. Once that's done, you can ask Google Assistant questions and give it commands by pressing-and-holding the action button until you've finished speaking, then let go. You can ask Assistant anything you'd ask it on your phone, or through Google Home. You can ask it for the weather, what calendar events you have coming up, send an email, set a reminder, perform Google searches and control your compatible smart home devices. There are some limitations on iPhone, though. You can't ask it to send an SMS or iMessage, for instance, nor can you ask it to play music through Spotify. One workaround to this is using the play/pause button to launch Siri on iPhone instead. On Android it's a different story. Ask it to play Spotify playlists or send a message on Android and it will, no problems. One additional Google Assistant feature is the ability to have it read your notifications when they come through. Like other Bose headphones, when a new notification lands on your phone you get a voice prompt saying which app it's from. On the QC35 you can press the action button once and Google then reads the full message for you. Sadly, you can't reply or interact with that notification once it's been read, so you still need to pull your phone out of your pocket for that. If you're ever stuck with what to do, there's a section within the Google Assistant app that gives you a quick overview of the Bose headphones and even a tutorial section to help you get the most out of the Assistant features. One small issue we had with Google Assistant was that each time we tried to use it immediately after powering on and connecting the headphones, it told us we had to unlock our phone, relaunch the Assistant app and try again. Both Bluetooth-conected performance and battery life are great from the QC35 II. We never experienced any glitches, the connection remained rock solid the entire time - regardless of which device we paired it with. Similarly, the battery was more than capable of handling even the most heavy usage. After roughly five hours combined of play time on a long train commute, it was just about down to somewhere around 80 per cent, having been fully charged before the first leg of the journey. We don't know the exact level, because Bose's app only shows in increments of 10 per cent, but given all of our testing, you'll comfortably get at least the advertised 20 hours of playback before needing to find a power source. What's more, if you've got a device with a headphone jack, you can just use that instead if the headphone ever goes completely flat. Or you can make use of the fast-charging - which delivers 2.5 hours of further playback after just 15 minutes at the plug. That's quite as impressive as the 25-30 minutes we got from the Beats Studio 3, but it's certainly good enough to get you through a couple of weeks of commutes. One thing you can be sure of with Bose is that your music will sound great. The QC35 II continues the trend of full-sounding, detailed and balanced audio. 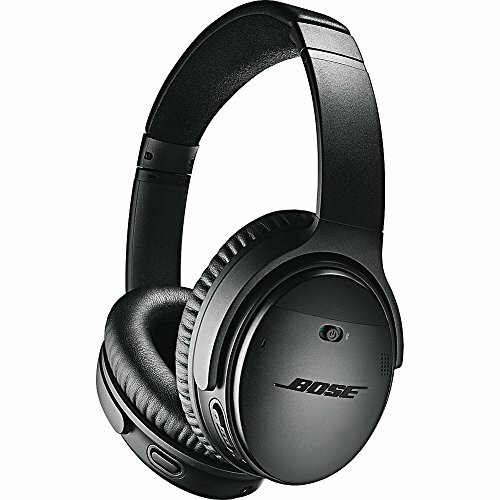 What's great about Bose's sound is that it doesn't seem to matter how loud or quite the headphones' volume is, you get the same quality, without distortion at higher levels. Mid-levels, bass and treble are balanced so that bass is clearly there without overpowering a track. And you get some impressive detailing in the low-end, particularly when listening to songs with acoustic instruments like an upright double bass. One thing worth noting with the Bose headphone is that the set does seem more tailored towards listening to music with actual instruments (preferably acoustic) rather than synth-heavy underground music. In the genres where bass should be almost over-powering, the low-end come across a little bit lacking in heavyweight punch. But stick on something like Elbow's most recent album and it just sounds phenomenally impactful. Noise-cancelling is a Bose speciality, too. That's what these headphones are well-known for handling: commuting without the outsdie noise. Although the QC35 II won't cut out all of the noise around you, it does a great job cutting out the low-drone of a moving train or airplane - which is somethingfrequent flyers will huegly appreciate. Once you experience it, it'll be hard to go back. The QC35 II doesn't adapt to ambient noise around it in real-time like the Beats Studio 3, but you certainly won't be bothered by surrounding noises anyway, as the cancelling technology is so impressive. And now there's three degrees of strength when it comes to noise-cancelling - which is great if you've previously felt Bose's ANC to be a little bit too "stuck in a vacuum" in its severity. While some might want a bit more punch from the sound - particularly the lower-end - the overall quality is superb and the three levels of noise-cancelling is a great feature to have for a variety of scenarios. Like its predecessor, the new QC35 design is well considered, durable and practical enough to be worn all day long - even if you wear glasses. And with noise-cancelling technology that's up there with the best, the QC35 II easily earns its place as the long-haul flyers' noise-cancelling cans to choose. The PX is a stylish pair of headphones that sound fantastic. We certainly welcome the company finally embracing ANC because the PX is a shining example of just how good noise-cancelling cans can be. Sony has made great strides in the headphone market in the past couple of years. In the WH-1000XM2, it has created perhaps the best noise-cancelling over-ear headphones we've ever tested. Having put in a strong performance in their original guise, the second coming delivers a repeat performance - with a little extra. Previous Beats headphones had a reputation for being far too bass-heavy and lacking in detail or class, but the Studio 3 Wireless surprised us by turning those assumptions upside down. It's a pair of headphones that sounds good, lasts ages between charges and is super convenient for Apple users thanks to its W1 Chip.